Google Play served more downloads than Apple's App Store in the past three months, but the latter surpassed the former in terms of revenue, according to App Annie's latest quarterly market report. Play Store downloads exceeded those from the iTunes App Store by around 60 percent in Q3 2014, up from 25 percent in the year ago quarter, something which can be partially attributed to rapid adoption and growth of Android in developing and emerging markets. According to the report, countries like Brazil, India, and Indonesia have driven explosive growth in Play Store downloads. While Brazil's market share of Google Play downloads increased more than any other country, Indonesia has been witnessing a double-digit, quarter-on-quarter growth for more than two years. But when it comes to revenue, Apple is ahead of Google, with App Store downloads in the last last quarter generating 60 percent more revenue than Play Store. One possible reason for this could be that users in developing markets, where Android has seen tremendous growth lately, are more likely to prefer free apps over paid apps. 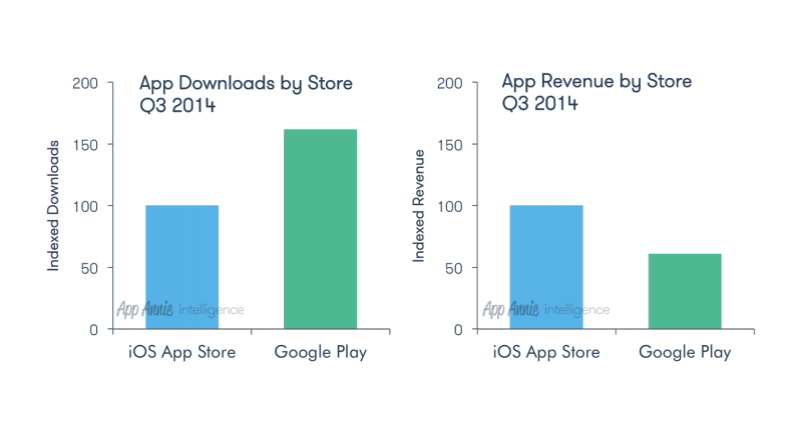 Games have always accounted for the majority of Play Store's worldwide revenue, a trend that continued last quarter. The report noted that games were responsible for nearly all of Google Play’s Q3 revenue growth in the US and South Korea. Another standout from the report was that social media and messaging apps, like Facebook Messenger, Line, and more, continued to experience strong growth across both platforms. “Facebook Messenger’s downloads jumped on both stores in late July following Facebook’s strategic decision to move all worldwide messaging functionality from Facebook to Facebook Messenger. Its downloads vaulted in August and increased yet again in September", the report said.